Frutti D'Estate tapestry or Summer Fruits tapestry shows a work of gorgeous French tradition. In this tapestry we see a celebration of the harvest of summer with peaches and foliage in a large ornate urn, surrounded by motifs from nature including leaves and vines, as well as a bird and feather elements below. The color palette in this work is beautiful with golds and greens temptered by browns and beiges. The composition is based on the traditional French portiere tapestries where the elements from nature are used to create designs and decorations to create a gorgeous ornate work. 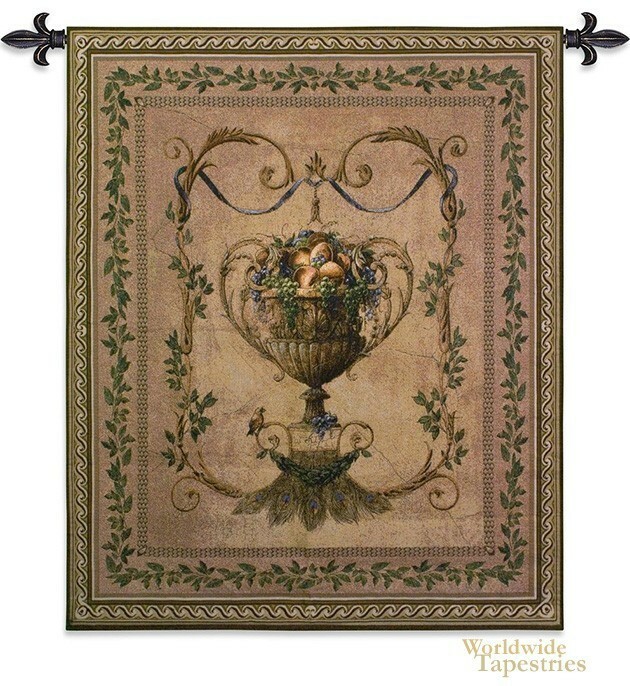 Frutti D'Estate tapestry is backed with lining and tunnel for easy hanging. Note: tapestry rod and tassels, where pictured, are not included in the price.